Learning how to infer and back up inferences with strong evidence is such an important skill for students to master. So, of course, it is not the easiest one for them to grasp (and even sometimes enjoy). 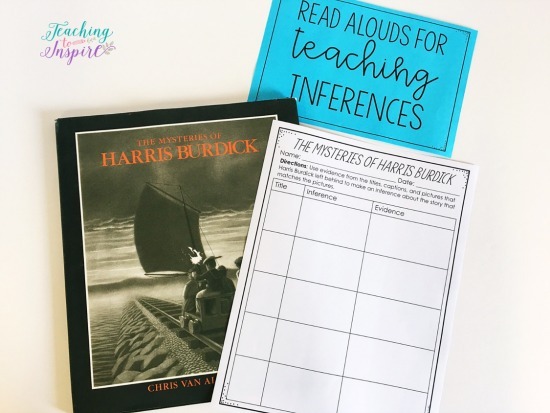 When I am teaching inferences for the first time with a group of students, I keep this in mind and choose super high-interest read alouds that my students love digging into to find evidence. 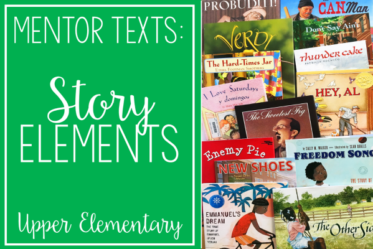 This post shares my favorite inference mentor texts. 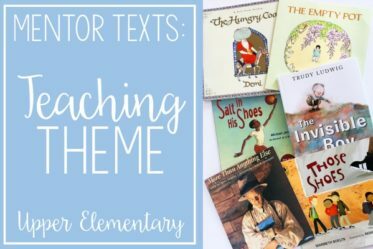 Note: The printables and activities shown with each read aloud are optional but will help you teach the lesson and use the book the way I recommend. 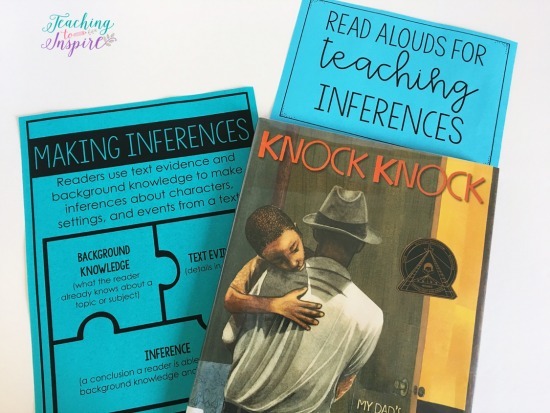 If you wish to purchase the printables, you can find them in my Making Inferences Activities Resource pack by clicking here. Amazon Affiliate links are included if you wish to purchase the books listed in this post through the links provided. 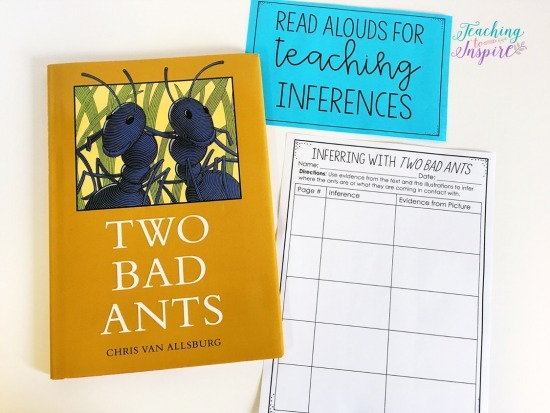 Two Bad Ants is perfect for introducing inference in an non-threatening way. For this lesson, I have the students infer what the ants are seeing or coming in contact with while they are in the kitchen of a house (while they are on a hunt for sugar crystals to bring back). They use evidence from both the text and the picture to back up their inference. Click here to see Two Bad Ants on Amazon. Another illustration-based book, The Mysteries of Harris Burdick is another great starting point for making inferences. In this read aloud, a man drops off a set of pictures at a book publisher’s office. The pictures only have titles and captions, but Burdick promises the stories to come if the publisher is interested. However, he is never heard from again and all that is left are the pictures. The students use the title, captions, and the illustrations to infer the story that matches the picture. They love this! Click here to see The Mysteries of Harris Burdick on Amazon. The Stranger is perfect for teaching inferences because the “stranger” is a mysterious figure and it is never revealed who he really is. The students must use clues to infer who he may be. Several clues throughout the story lead the students to believe that the stranger is either fall or nature in a person format. This is a great read aloud because there is so much evidence that the students can use to back up their inference. Click here to see The Stranger on Amazon. 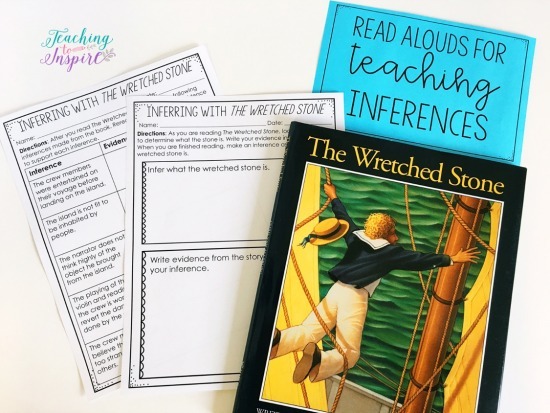 The Wretched Stone is a gold-mine for teaching students to infer. In the book (written as a captain’s log), a captain brings a stone on board that he discovers on an uninhabited island. The crew become entranced by the “wretched stone” and lose any interest in anything but watching it. For this read aloud, the students infer what the wretched stone is using evidence from the text. Then we take it a step further and find evidence to support inference statements that I wrote ahead of time. This takes it up a notch because they are not making their own inferences, instead they are finding evidence from the text to support someone else’s inferences. Click here to see The Wretched Stone on Amazon. The Wreck of the Zephyr is another story that leaves the students guessing about. In the story, an old man tells the story of a sailor who once learned to sail above the water before crashing his sailboat. I use this read aloud after my students have been introduced to inferences and have experience making them. For the lesson, my students generate their own questions before, during, and after the reading. While we are sharing our questions, we determine if the questions are literal or inferential and then answer them, or attempt to answer them accordingly. Click here to see the Wreck of the Zephyr on Amazon. 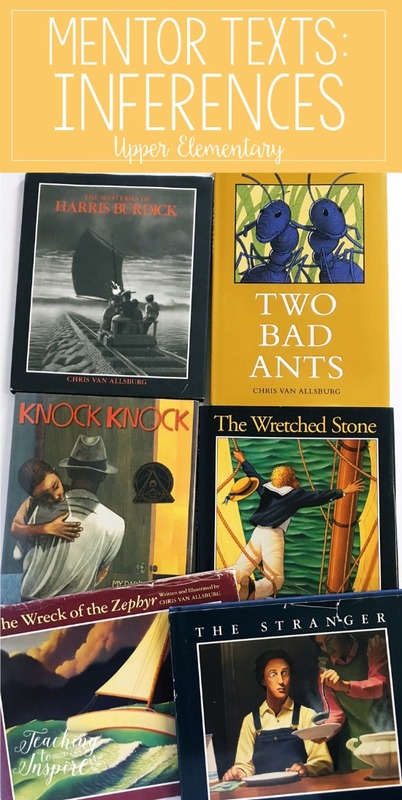 The only book not by Chris Van Allsburg to make the list, Knock Knock: My Dad’s Dreams for Me is a touching story that will resonate with many students who are being raised by a single parent. For this book, I have my students infer where the dad is or what has happened to him. Then, of course, they must use evidence from the text to support their inference. The parents are divorced and he has moved far away. He is in jail or prison. He has passed away and the mother wrote the letter to the son. Definitely use your teacher discretion on this one, but this read aloud really resonates with many students today. Click here to see Knock Knock: My Dad’s Dreams for me on Amazon. With some of my classes, I have had to do more picture inferences to ensure they understand the concept of making inferences and supporting those inferences with evidence. 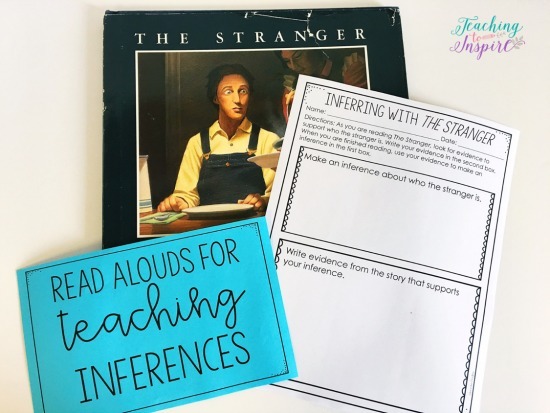 I use picture inference printables that are available in my Making Inferences Activities Resource mentioned at the beginning of this post. Another problem I run in to is that I need my students to explain how their evidence supports their inference. 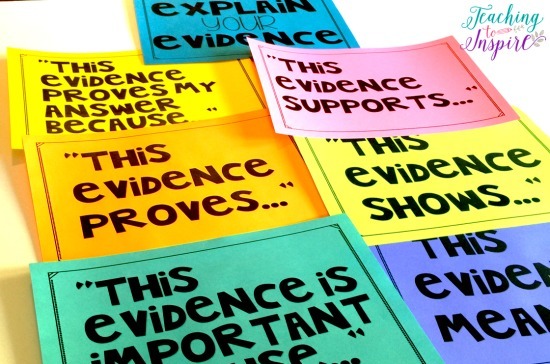 They usually struggle with this, so I created a set of Explain Your Evidence posters, which you can grab for free here. 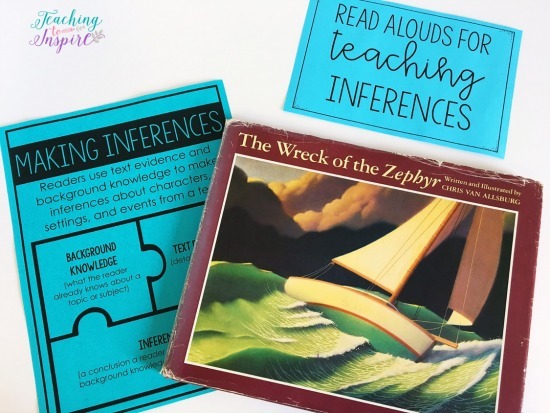 I prefer to teach my students to infer and cite evidence early on in the school year because its sets the foundation for so many of the other reading skills and standards. Click here to read more about how I pace my literacy standards. 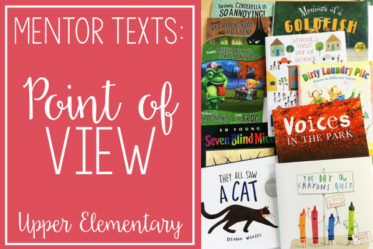 What are your favorite read alouds for teaching your students to make inferences? Let me know in the comments! Thanks for sharing these! I enjoyed reading and I learnt a whole lot as well. Can we purchase the handouts that go along with each read aloud? Jennifer! YOU are AMAZING! I love all of the information you have shared. Thank you for ALL you do and helping me be a better teacher.